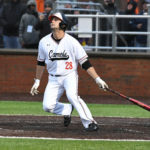 Buies Creek — A ninth-inning single off the bat of Luis Gimenez sent the Campbell Fighting Camels to a 7-6 walk-off win over No. 9 ECU on Wednesday night at Jim Perry Stadium. 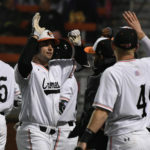 In CU’s home opener, the Camels (2-2) never trailed, but withstood a pair of three run innings by the Pirates (3-1), who tied the game at 6-6 in the top of the ninth. With one away in the bottom of the ninth, Matthew Barefoot (1-for-3, 2 RBI) reached on an infield single before AJ Hrica (1-for-5) singled into center field. One batter later, Gimenez (1-for-4, RBI) delivered the game-winning base hit into right field, scoring Barefoot from second base. ECU scored six runs in the final two innings on four hits after the Campbell pitching staff held the Pirates to no runs and two hits in the previous seven innings. 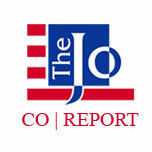 Seven Camels pitched in the win and combined to strike out 11 Pirates, with each pitcher recording at least one K.
Junior right-hander Seth Johnson, a transfer from Louisburg College, got the starting nod against ECU, fanning five batters across 4.0 innings; he allowed just one hit and two walks. 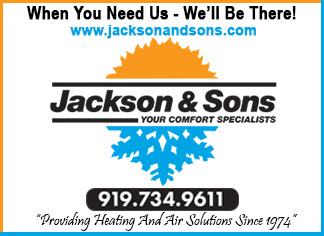 Junior righty Wyatt Tyson (1-1) was credited with the win, his first of the season. Barefoot’s sac fly in the third gave the Camels a 1-0 lead before junior infielder Collin Wolf (1-for-3, RBI, BB) tacked on another with an one-out RBI single in the fifth. Campbell added two more runs in the seventh on two ECU errors, heading into the eighth with a 5-0 lead. ECU’s Bryson Worrell’s three-run home run in the eighth trimmed Campbell’s advantage to two, 5-3, but Campbell junior first basemen Matthew Christian (2-for-4, 3 R, 1 RBI) launched his second career homer in the bottom half, a line drive shot to left field. 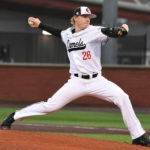 After coming in the eighth and leaving a runner stranded on third, Campbell closer Tyson Messer retook the mound in the ninth; however, the senior allowed three straight walks to load the bases. Tyson relieved Messer and worked a 6-3 double play, putting the Camels one out away from the win, but also allowing the Pirates to pull back within two, 6-4. With a runner on third and two outs, Alec Burleson tied the game on the second pitch of the at-bat with a two-run homer to left center. 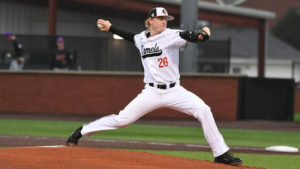 Tyson worked out of the inning by way of a strikeout, keeping the game tied, which set up the win in the bottom of the ninth. 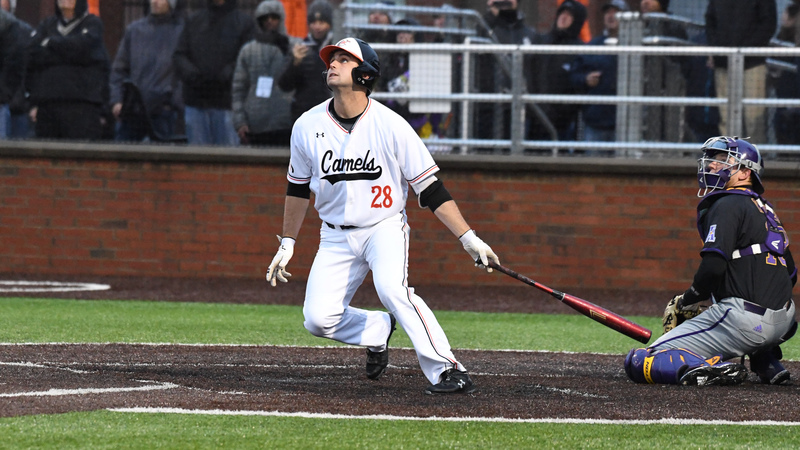 Campbell’s win over ECU is the first since March 10, 2015, when the Camels won in Greenville, 9-4. The walk-off victory is the first for CU since March 24, 2018, when 2018 graduate Christian Jones placed a walk-off bunt to score Gimenez for a 4-3 win over Gardner-Webb. 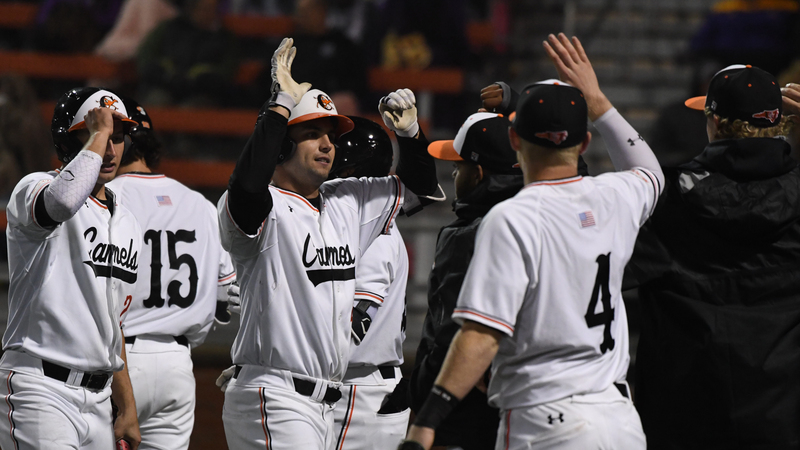 The Fighting Camels will continue their eight-game home stretch by welcoming the Georgetown Hoyas to Jim Perry Stadium for a three-game series this weekend from Feb. 22-24. First pitch for Friday’s game is scheduled for 5 p.m.